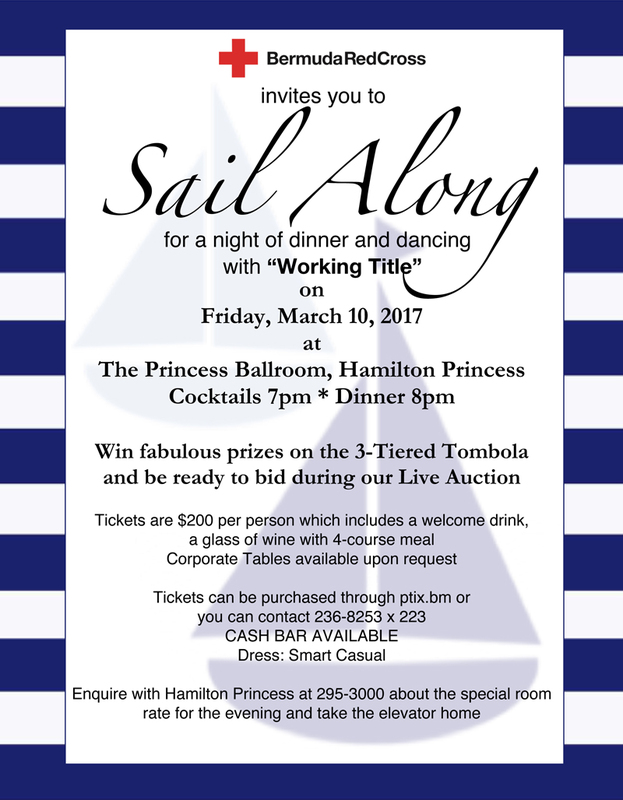 The Bermuda Red Cross is inviting the public to “sail along for a night of dinner and dancing” with “Working Title” on Friday, March 10 at The Princess Ballroom at the Hamilton Princess, with cocktails at 7.00pm and dinner starting at 8.00pm. A spokesperson said, “Sail along for a night of dinner and dancing with “Working Title” on Friday, March 10, 2017. Look for a night of good food, great prizes and fantastic music. Working Title keeps the dance floor full and people can not stop dancing up until the end of the evening. “Our three-tiered Tombola tables have some very unique prizes and experiences to win. During our Live Auction the prizes are limited but that is because they will that good. Tickets can be purchased on ptix.bm or by contacting Suzanne on 236-8253 [extension 223].